Attenuated Salmonella typhimurium has been demonstrated experimentally as a novel anticancer agent because of its favored growth within tumors, limited toxicity, and antibiotic susceptibility. In order study the ability of S. typhimurium to provide spatiotemporal control of cytotoxic protein delivery, a radiation-inducible expression system for secretion of TNF-related apoptosis-inducing ligand (TRAIL) was developed. Prokaryotic-expression plasmids for TRAIL or green-fluorescent protein using the RecA promoter were electroporated into the msbB- purI- strain, VNP20009. In a syngeneic model of mammary carcinoma using Balb/c mice, the effect of systemic infection of bacterial vectors with or without induction by 2Gy gamma-irradiation at two days after colonization was assessed, examining outcomes of tumor growth and thirty-day survival. In vitro confirmation of extracellular TRAIL secretion and caspase-3 and caspase-8 activity were verified, with increased apoptosis measured by annexin-V/propidium iodide flow cytometry (p<0.05). 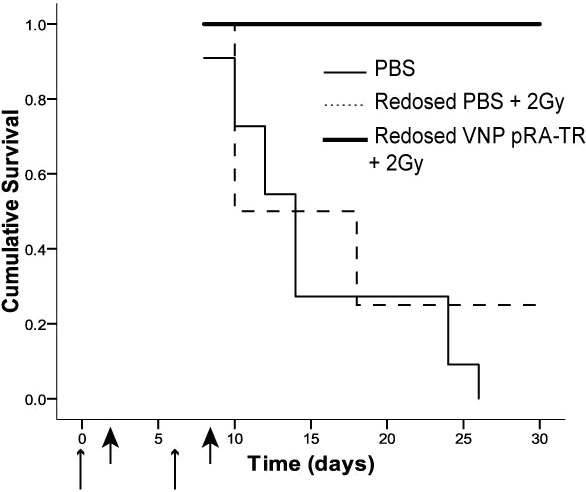 The expression vector for TRAIL induced by radiation led to a significant delay in tumor growth and improved thirty-day survival in vivo, with a hazard ratio of 0.24 (95% confidence interval, 0.08 – 0.75; p<0.05) in comparison with irradiated controls. Repeated dosing and irradiation after one week limited tumor growth from baseline, with a significant survival benefit from 0% to 100% at one month after initial treatment (p<0.05).